Ballathie House Hotel, is one of the UK's leading country house hotels situated on its own estate overlooking the River Tay, gateway to the Scottish Highlands. Approx. 12 miles from Perth City Centre, Ballathie offers a true Scottish Highland hotel experience, with award winning cuisine in a country house of great character and distinction. The Scottish Highlands and Perthshire, offer some offer some of the finest salmon fishing and scenery in Scotland. Tay salmon fishing is renowned the world over, Ballathie's riverside location is ideal for a fishing break in the Scottish Highlands. 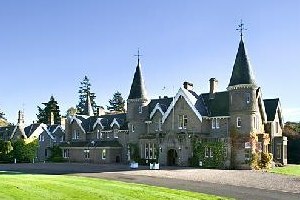 Location and reputation for excellent service mean Ballathie is popular for Scottish Weddings and Conferences.